Outdoor decor transforms your seating area with welcoming color and style. Rugs, throw pillows and door mats. 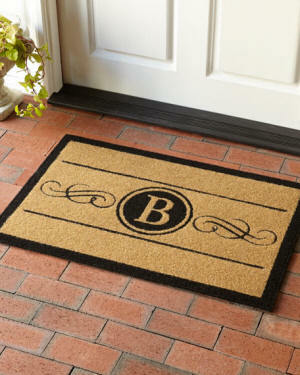 These mats are the most durable, elegant, all-weather personalized door mats available. They make a wonderful house warming gifts, wedding gifts, Christmas gifts or any gift! But don't forget about yourself. We think this mat will look amazing in front of your door too! We call our mats Coco "Not" because unlike ordinary coco mats made out of scratchy coir, ours don't shed or shred, they're antibacterial, don't mold, mildew or hold water, fade resistant and are soft enough to walk on but rough enough to catch the dust and dirt. Cleaning is a breeze. Use a broom for a light dusting or hose off with water to remove heavier soiling. Our mats are inlaid, NOT printed and are finished with a non-slip backing that keeps them in place to perform better than any other entry mat on the market today. Traditional rug with precision inlaid details. UV stabilized polypropylene and virgin rubber. All-weather; antibacterial; fade resistant. Does not shed, shred mold or mildew, has a thinner profile to avoid trip hazards and interference with door sweeps and low thresholds. Personalization available. Neutral or Black Traditional rug with precision inlaid details. UV stabilized polypropylene and virgin rubber. All-weather; antibacterial; fade resistant. Does not shed, shred mold or mildew, has a thinner profile to avoid trip hazards and interference with door sweeps and low thresholds. Personalization available. 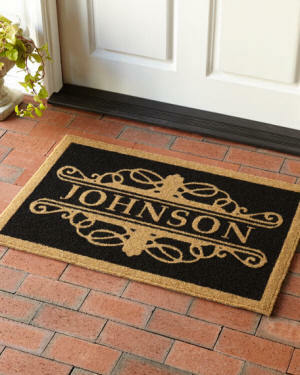 Neutral or Black Get in the Christmas spirit with the most beautiful, durable all-weather entry mat available anywhere. This elegant Christmas door mat will make a statement this season and may seasons to come. These Coco "Not" mats don't shed or shred, don't mildew or hold water, are antibacterial and soft to walk on but rough enough to catch the dust and dirt. Cleaning is a breeze. Use a broom for light dusting or hose off with water to remove heavier soiling. Hand-woven from natural coconut fiber and topped with a pair of lacy fern fronds, this tufted, terrain-exclusive doormat removes dirt and absorbs moisture while resisting mildew and offering long-lasting durability. Coir fibers; vinyl backing. Intended for use in a sheltered outdoor area Printed with an illustration from Michigan designer June & December, this terrain-exclusive doormat is hand-crafted using natural coconut fiber. Add a personalized welcome to your porch or entryway with this monogrammed doormat, each one made from natural coconut fiber and finished with a striped border. Coir fiber Add a personalized welcome to your porch or entryway with this monogrammed doormat, each one made from natural coconut fiber and finished with a striped border. A herringbone weave dresses up this rugged jute mat for the doorstep, each one hand-woven especially for terrain. Handcrafted transitional rug. Polyethylene terephthalate (PET) yarn. Hand-woven from natural coconut fiber, this tufted doormat removes dirt and absorbs moisture while resisting mildew and offering long-lasting durability. Utilizing runway fashion and a bold, exciting color palette, this rug lets you create the ultimate indoor or outdoor oasis. Machine tufted of polypropylene. Wide rugby stripes bring a charming, casual look to this easy-care rug that is suitable for indoor or outdoor use. This hand-woven rug's texture is similar to that of a flatweave Dhurrie, yet it has the softness of a more traditional pile rug Handcrafted tufted loop rug. Made of polyester/acrylic blend. Soft underfoot yet durable enough for high traffic areas. This elegant Afuera Indoor/Outdoor Country Cottage area rug from Couristan has a charming aged look courtesy of faded Persian-inspired floral motifs accented in subtly contrasting hues of beige and ivory. Crisp pin stripes on a colorful ground and easy-care, weather-safe construction make this bright, hand-woven rug welcome in transitional or contemporary spaces both inside and out. This rug has the look and texture of a flatweave Dhurrie but the softness of a more traditional pile rug. A bold update on classic styles, the warm brown ground of this fantastic Dolce Indoor/Outdoor Coppola area rug from Couristan is embellished with wondrous floral motifs accented in shimmering hues of gold and gray. With its regal border and neutrally-shaded colors, this indoor/outdoor rug adds subtle tonal interest anywhere. Woven of a durable acrylic/polypropylene that is UV stabilized to minimize fading. Indoor/outdoor rug can be hosed off for simple cleaning. In red, sage, brown Designed for the high-traffic home (ahem, those filled with dogs)—this braided indoor/outdoor rug is created from a blend of washable, spill-absorbing materials that are mold and mildew resistant. UV treated for long-lasting outdoor use, this low-maintenance rug looks like an indoor rug but can live anywhere inside, or outside, your home. The low-profile construction makes this rug an easy fit in front of a doorway. Polypropylene. Hose off to clean. A heavy-duty polypropylene yarn and a triple-weave construction make this rug ideal for high-traffic areas both indoors and outdoors. The two-tone neutral design lends a dimensional aesthetic that mimics fragile and versatile sisal fiber. Narrow binding on edges. Polypropylene. Hose off or vacuum. Turkey. Designed with a bit of whimsy and a whole lot of charm, the prints in this limited-edition collection - everything from curled-up kittens to ditsy florals - speak to the heart and art of Anthropologie. Here, a durable floor covering grounds any sun room or outdoor oasis with its delightful motif. Designed by Sarah Hankinson in collaboration with Anthropologie, this vibrant and versatile floor covering anchors any indoor or outdoor space. Whether used in a sun room or an outdoor oasis, this versatile floor covering anchors any space - while adding an extra layer of color and texture. Whether used in a sun room or on a poolside patio, this versatile floor covering anchors any space - while adding an extra layer of color and texture. Whether used in a sun room or on a poolside patio, this versatile floor covering anchors any space - while adding an extra layer of color and texture. Versatile and durable, this floor covering anchors any sun room, shady veranda, or outdoor oasis. Bordered by a contrasting sand frame, the soft blue central ground of this durable Monaco Maritime area rug from Couristan can bring familiar minimalist style to any indoor or outdoor setting. Flat-woven polyester. Suitable for indoor or outdoor use. UV-resistant; rotate periodically for even wear Whether used indoors or out, this floor covering anchors any space, bringing a room - or outdoor oasis - together. Handcrafted, decorative pillow made from solution-dyed Sunbrella® acrylic fabric. Stain, fade and water resistant. Handcrafted, decorative pillow made from solution-dyed Sunbrella® acrylic fabric. Stain, fade and water resistant. Handcrafted decorative pillow made from solution-dyed Sunbrella® acrylic fabric. Stain, fade and water resistant. Sealed insert of weather-resistant, faux down fiber. Machine wash cold, air dry. Handcrafted decorative pillow made from solution-dyed Sunbrella® acrylic fabric. Stain, fade and water resistant. Sealed insert of weather-resistant, faux down fiber. Indoor/outdoor use. Machine wash cold, air dry. Handcrafted, decorative pillow made from solution-dyed Sunbrella® acrylic fabric. Stain, fade and water resistant. Hidden zip closure. Indoor/outdoor use. Sealed insert of weather-resistant, faux down fiber (polyester). Machine wash cold, air dry. Handcrafted, decorative pillow made from solution-dyed Sunbrella® acrylic fabric. Stain, fade and water resistant. Hidden zip closure. Sealed insert of weather-resistant, faux down fiber (polyester). Machine wash cold, air dry. Handcrafted, decorative pillow made from solution-dyed Sunbrella® acrylic fabric. Stain, fade and water resistant. Handcrafted decorative pillow made from solution-dyed Sunbrella® acrylic fabric. Stain, fade and water resistant. Sealed insert of weather-resistant, faux down fiber. Machine wash cold, air dry. An escape with the Heron towel towards the romantic bay of wineglass in Tasmania or the relaxing turquoise waves of Tokashiki island in Japan. An oriental illuminated break enlightened by the rising sun rays. Forget your everyday life and let yourself be surprised Color-framed cotton velour beach towel has terry reverse. 500 GSM weight. With the Flamingo towel, a single ticket to the warm sands of Saint-Barthelemy and the desert beaches of Jose Ignacio. An elegant break rocked by the gentle fragrance of trade winds. Just pack, cling on to flamingos wings and fly away to liberty. Whether floating in the pool or lounging pool side, the FUNBOY Rainbow Clear Chair provides the ultimate in relaxation and style with a modern, minimalist design. This tricolor float features a vibrant clear pink, orange and yellow colorways to add a trifecta of color to any scene. Use in the pool, outdoors or indoors to unwind while making a statement. Modern ergonomic design. Beverage cup holder. Whether you're lounging poolside or sunbathing in the sand, this colorful towel is a summer must-have. Founded in a Georgian townhouse in 1995, London's original Soho House aimed to be a home away from home for creative-minded people. Today, its opulent clubs span across Europe and North America, and its timeless housewares are well-curated luxuries for your home. Yarn-dyed cotton Bird print beach towel. Cotton. Machine wash. Whether you're lounging poolside or sunbathing in the sand, this colorful towel is a summer must-have. Ride in style on your own personal watercraft. Featuring classic lines and a sleek, life-size design that's over six feet long. Ride those waves! Top down riding the new FUNBOY Convertible Daybed. Features retro wing tips and a vintage pink color, the Convertible Daybed is your ticket to ride. Fits two adults comfortably. FUNBOY's classic float in a Unicorn shape with new clear pink material! Filled with metallic glitter to create the most dreamy float experience ever. Features a new stable base design and added cup-holder for 2019! Handcrafted chair swing. Made of polyester. Pillows are stuffed with polyester and Olefin; covers are machine washable. Includes metal hook. Outdoor safe. Handcrafted three-piece swing with dragonfly back pillow. Polyester cover. Polyester/olefin fill. Includes metal hook. Indoor and outdoor use. Three-piece swing set with artisanal design back pillow. Polyester cover. Polyester/olefin fill. Includes metal hook. Indoor and outdoor use. Handcrafted chair swing. Made of polyester. Includes metal hook. Outdoor safe; for use indoors or out. Machine wash pillow cover; clean swing with garden hose. Handcrafted chair swing. Made of polyester. Includes metal hook. Outdoor safe; for use indoors or out. Machine wash pillow cover; clean swing with garden hose. Handcrafted indoor/outdoor swinging chair with pillows. Made of polyester; feels soft like cotton. Machine washable pillow covers. Olefin-covered cotton rope and hardwood brace for hanging.